This handout from the Phnom Penh Post shows a house sawed cut in half by a Cambodian couple as they were hoping to avoid the country's convoluted divorce process in Prey Veng province near Phnom Penh. 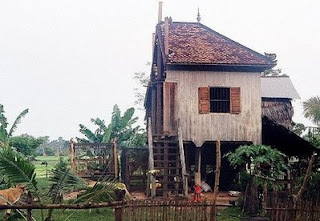 PHNOM PENH, Cambodia - A couple in rural Cambodia has terminated their 18-year marriage with a divorce settlement that entailed sawing in two the wooden house they once shared, villagers said Friday. The husband, 42-year-old Moeun Sarim, has taken away with him all the bits and pieces of his half a house, said his 35-year-old wife, Vat Navy. "Very strange, but this is what my husband wanted," she said by phone from a village about 62 miles east of Cambodia's capital, Phnom Penh. She said they ended their marriage last month. "He brought his relatives and used saws to cut the house in half," she said, adding that she now owns the other half that is still standing. The house is made from wood with a tile roof and propped up on wooden pillars, a typical style for a Cambodian country home. She said her estranged husband and his relatives, after ripping apart half of the house, carried all the debris to his parents' house nearby. She said the divorce was prompted by her husband's jealousy about her alleged relationship with a policeman in the village. She denied having an extramarital affair. "He wanted a divorce, and I said, `Let's divorce,'" she said. The husband could not be reached for comment. Bou Bout, a village chief, said local officials and police were present as witnesses the day the couple split their 20-by-24 1/2 foot house into half.